Get the look of top fashion glamour with low-cost, lightweight acrylic beads; the woven wool appearance gives these the soft feeling and warm to touch. Decent appearance and bright color are great for jewelry decoration. Colour :Pure White Colour. 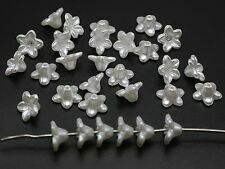 These flower beads have the hole through the center of the flower. Material: Acrylic Plastic. Colour :Mixed Colour. These flower beads have the hole through the center of the flower. Material: Acrylic Plastic. Colors of what you get may be different from the photo. colors are mixed at random. Colour :Ivory Colour. These flower beads have the hole through the center of the flower. Material: Acrylic Plastic. Glass Seed. Seed&Bugle Beads. Acrylic Beads. Wood & Nut Beads. Glass Pearl. Feature: round shape, combined beads, could be separated in 5 parts, pearl finish, chunky, loose beads, nice for beading jewelry making. Local pickup IS possible. Direct deposit is the next best option. Money Order is acceptable(Australia only). Make Supersized Seem Small. Get Images that. Size : Approx:10mm Dia. Hole size: 1.6mm. Quantity : 200 PCs. Bridal Pearl Smooth Round Craft Beads Product Details Shape: Smooth Round (716) Size: 10mm Hole Size: 1mm Material: Acrylic (Plastic) Finish: Pearl Color: Bridal (346) Country Of Origin: United States Number of Beads: Approx. 150 Additional Information: Product Description We have a great range of these acrylic faux pearl smooth round craft beads, with many different colors available and all made here in America by The Beadery. 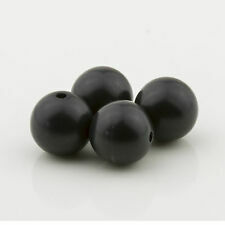 These plastic beads measure 10mm and have a 1mm hole. They are ideal for making necklaces, bracelets and other jewelry projects. Made in the USA by The Beadery, they meet all required safety standards. This pack contain approx. 150 beads in this wonderful color. About BeadTin BeadTin probably has the best range of Pony Beads anywhere in the US, plus a great and growing range of craft beads. 84pcs 10mm Acrylic Round Imitation Pearl Beads . quantity: 84pcs individual pearl beads. Size: 10mm. Style: Loose pearl beads-individual beads ,easy to re-string. Color: dark grey. Material: acrylic. (Category: Imitation Pearl. Hole dia:4mm. hope you could understand. 1)There might be a slight difference in the tone of colors depending on the resolution of your monitor. Images are for reference only. Size: 10mm. Style: Round. Color: Black. These gorgeous beads are imitated pearl beads made of acrylic. With plump shine and high quality, these imitated beads look like real pearl ones indeed. It can be easily bunched by cords, strands and can be used for all kinds of decoration. They have a pearlised finish on them and are flat backed. Local pickup IS possible. Direct deposit is the next best option. Money Order is acceptable(Australia only). Local pickup IS possible. Direct deposit is the next best option. Money Order is acceptable(Australia only). They have a pearlised finish on them and are flat backed. It has been tested in the United States and is free of lead, cadmium and phthalates. choking hazard - not children under age 3. 100 of each color: 8 colors. 85pcs 10mm Acrylic Round Imitation Pearl Beads . Size: 10mm. Style: Loose pearl beads-individual beads ,easy to re-string. quantity: 85pcs individual pearl beads. Shape: round. Color: white. Quality: our pearls are all dyed by hand which have a thick layer, high luster and smooth surface. 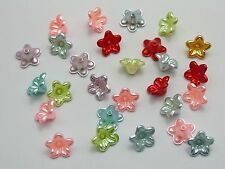 50 x Imitation glitter pearl beads. Mixed colours. 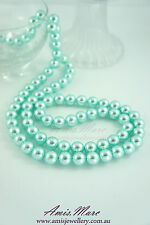 84pcs 10mm Acrylic Round Imitation Pearl Beads . Size: 10mm. Style: Loose pearl beads-individual beads ,easy to re-string. 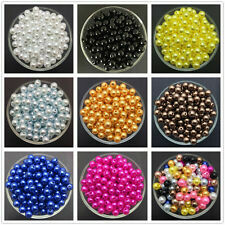 quantity: 84-85pcs individual pearl beads. Material: acrylic. Color: silver/light grey. 85pcs 10mm Acrylic Round Imitation Pearl Beads . quantity: 85pcs individual pearl beads. Size: 10mm. Style: Loose pearl beads-individual beads ,easy to re-string. Material: acrylic. Shape: round.